Description: With 1875 marking the first recorded history of the macadamia nut, it is a relatively newly known nut compared to its counterparts. The only true major commercial food crop native to Australia, the genus Macadamia was named after John Macadum, MD, Secretary of the Philosophical Institute of Victoria after a British colonist colleague discovered the unknown tree in Australia. The genus consists of at least 10 species, only 2 of which produce edible nuts, the smooth shelled Macadamia integrifolia and the rough shelled Macadamia tetraphylla. Macadamia nuts grow on evergreen trees ranging from 6-40ft high and they typically begin to bear fruit around 7 years after plantation. The edible part is the white kernel with a smooth surface, known for its sweet taste and nutty aroma. 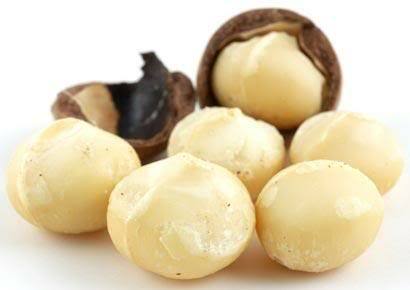 Macadamia nuts are usually eaten raw and a nut cracker is required to penetrate the outside shell. They are often roasted, salted or sweetened and its crunchy texture can often be sprinkled over salads. Macadamia oil is very similar to olive oil and can be used similarly when cooking. Macadamia butter is gluten free, high in protein and makes for a good substitute. Kitchen Pharmacy: Like many nuts, macadamia nuts have been proven to help lower one’s cholesterol especially the bad cholesterol and are very heart healthy. They are packed with nutrients, minerals and vitamins but are toxic to dogs. Macadamia oil is often an ingredient in skincare and cosmetic products in general. Nutrient Information: Serving Size = 1 Each.